Casey Mechanical Inc. offers a wide variety of home comfort products and can service all of your plumbing, heating and air conditioning needs. We are proud to have partnered with some of the leading manufacturers of products to make any house a home. Carrier is the world leader in air conditioners, furnaces, HVAC and central air conditioning products, providing air conditioning, heating and refrigeration solutions for every size of home. A highly engineered Carrier system is the sophisticated way to keep your home healthy and comfortable. Whether you have an existing system or are building new construction, we're the experts to help you tailor the right synergy of heating and cooling products – giving your home ultimate comfort all year long. From heat pumps to thermostats to ventilators and more, turn to the experts at Casey Mechanical for your state-of-the-art system. If you care about the lowest annual energy costs, maximum comfort, longest system life and least expensive maintenance, then you are talking about Carrier and WaterFurnace geothermal heating and cooling systems. Geothermal heating and cooling systems offer high efficiency for low, low operating costs in a single packaged unit. They’re so efficient and environmentally friendly that the U.S. Environmental Protection Agency rates geothermal systems as the “best technology” and is termed the “clean” alternative. ● Savings: No other heating and cooling system offers lower operating costs, with savings up to 60% or more. Your monthly utility bills will be lowered dramatically to give you maximum savings for your family. few moving parts, these heating and cooling systems can operate efficiently for years with little maintenance. have a life in excess of 50 years. running in either heating or cooling mode. Every week, 3.5 million people experience a power loss. A power loss interrupts your home, your work and your life. More and more often, it is becoming a reality for home and business owners. Weather isn't the only reason power loss is becoming more common. The power grid is one of the most complex systems ever constructed, and very few new initiatives are being launched to address its shortcomings. Think about the last time a power plant was built or transmission lines were installed in your area. Then, think about how many new homes have been built over the same period. The need for an automatic home generator has never been greater. Installing an automatic home generator can put you and your family at ease. The unit is permanently installed outside of the home just like an air conditioner. When you lose power, the generator will automatically start itself and provide power back to your house within 30 seconds. When the utility is restored, the generator automatically shuts down and waits for the next outage. The unit gets its fuel directly from your natural gas line or liquid propane tank. There is no need to handle gasoline or run a maze of extension cords. In 1987, Heat & Glo created the direct-vent gas fireplace, making it possible to install a fireplace safely in virtually any room in the home. Practically overnight, the hearth industry changed from primarily wood-burning to direct-vent fireplaces that were gas operated. Since then, Heat & Glo's continued innovations produced numerous patented technologies that confirmed the company's position as industry leader. This relentless pursuit of improvement resulted in some of the most unique, realistic and efficient fireplaces on the market. 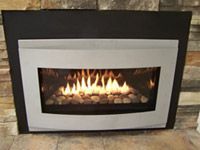 Heat & Glo now offers a complete line of gas, wood and electric fireplaces, stoves and inserts, unique surrounds and distinctive accessories – all designed to meet discriminating homeowners' desire for comfort, beauty and elegance. Heat & Glo supplies the fireplaces for the popular TV program Extreme Makeover – Home Edition. Keeping your feet warm is the key to comfort, which is one reason why homeowners are increasingly turning to Rehau® hydronic radiant heating systems over conventional methods. Conventional forced-air systems trap heat near the ceiling, where it’s least useful, while drying the air out by lowering its relative humidity. This dry air will always feel colder than more humid air at the same temperature. A radiant heating system starts at the floorboards, warming your entire home by delivering a comfortable, even heat without creating the drafts and dust problems associated with traditional heating methods. The comfort of hydronic radiant heating comes from heated water being pumped through a network of piping laid beneath the floor. By turning the entire floor surface into a giant low temperature radiator, floors and objects in the room become warmer and more inviting to the touch. Like rays from the sun, Rehau floor system puts your skin in direct contact with its heat source, delivering a comfortable warmth that starts with the coolest part of your body – your feet. Jackson Grills has become known for providing the highest quality products and premium craftsmanship. All product designs are crafted with the customer in mind, with thoughtful features that enhance your grilling experience. Manufacturing is also carefully overseen, with specific quality controls in place to ensure each product meets stringent quality standards. All of this is backed by our industry-leading Jackson Grills Limited Warranty, which provides peace of mind that you made the right decision when choosing a Jackson Grills quality product. Come in and ask us to show you our complete range of products and services to help improve your home.